AP/Charlie RiedelPolice arrest a man as they disperse a protest. RIOTS are rarely so widely anticipated. 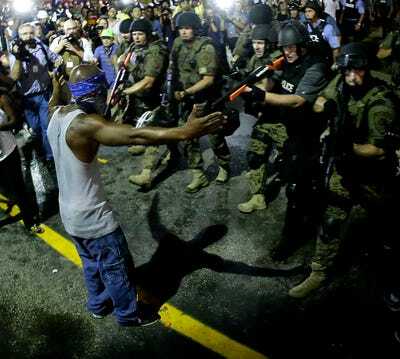 By 8pm on November 24th, when the prosecutor in Ferguson, Missouri, announced the grand jury’s decision not to charge a police officer with a crime for shooting an unarmed black teenager, Michael Brown, cops in riot gear were already in place and barriers surrounded municipal buildings. Mr Brown’s parents and Barack Obama called for calm. Yet soon America’s TV screens were full of burning police cars, crowds coughing on tear gas, and young black men throwing bricks and smashing shops. America’s history of racial injustice looked as potent as ever. That would be the wrong conclusion to draw. Looking back at the riots in Los Angeles in 1992 that followed the acquittal of four white police officers who had savagely beaten a black motorist, Rodney King, a lot has changed. America has a black president. The LA riots, which left 53 dead, happened in one of America’s great cities, and sparked violence in others. This time the focus was a struggling suburb; in Los Angeles black teenagers protested peacefully alongside white ones. Blacks plainly still suffer prejudice across America: they account for 86% of the vehicle stops made by police in Ferguson. But America’s race problem is increasingly one of class. Blacks’ biggest problem is now poverty, which is most visible in places such as Ferguson. Like many post-war suburbs across America, Ferguson is stuck between the prosperous white exurbs of St Louis and the city’s somewhat revitalised centre. In 1990 its population was three-quarters white; by 2010, it had become two-thirds black. The sub-prime mortgage crisis hit it hard. Many of its homeowners still owe more than they own. Solving the problems of places like Ferguson is less about passing more anti-discrimination laws than about rekindling economic growth and spreading the proceeds. But there are also ways of making politics and policing work better that would contribute greatly to racial harmony in America. 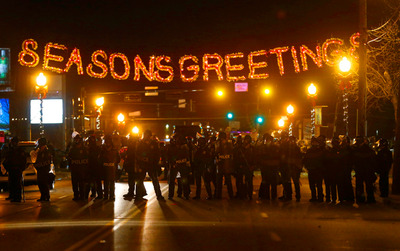 REUTERS/Jim YoungPolice form a line in the street under a holiday sign after a grand jury returned no indictment in the shooting of Michael Brown in Ferguson, Missouri November 24, 2014. Ferguson’s political institutions have not kept up with its demography. Of the city’s six-member council, five are white. The hapless mayor, James Knowles, is a white Republican who was re-elected in 2013 in an election in which fewer than one in eight eligible voters turned out. He is in charge of the police force, in which three out of 53 officers are black. Such disparities feed the belief — held by blacks across the country — that both justice and law-enforcement systems are racist. Police brutality reinforces that belief. If there was one lesson from the attack on Rodney King, it was that police officers should behave like civilians, not an occupying army. Around 500 people were killed last year by the police — though since nobody counts, nobody really knows. In Ferguson, bad policies help to explain why distrust turns to anger. Take, for example, the way the town is financed. In 2013 a fifth of Ferguson’s general revenues — some $US2.6m, in a city of 21,000 people — were derived from fines and asset confiscation. That is equivalent to $US124 a year for every man, woman and child in the city. Mario Anzuoni/ReutersA police officer holds his riot gun while demonstrators protest the shooting death of teenager Michael Brown in Ferguson, Missouri . Paying fines, even for minor traffic offences, can involve queuing for hours. Those who miss court dates can be jailed until they pay, accumulating more fines along the way. Slowly but surely, the justice system has become an elaborate mechanism for criminalising poverty. Smaller cities should stop using their police forces and courts as tax-collectors. 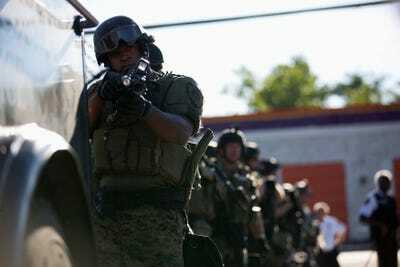 Police shootings should be taken much more seriously, and the federal government should stop enabling small police forces to buy military-grade weapons. Proper gun control laws would help: policemen who fear they will be shot are more likely to kill suspects. In their absence, body-mounted cameras might constrain police behaviour. Efforts should also be made to increase voter turnout. Ferguson, like many small cities, holds its municipal elections at odd times in odd-numbered years, when little else is on the ballot. If they coincided with national elections, more people would be paying attention. And attempts to restrict voting — by banning Sunday polls, restricting voting hours and requiring people to produce ID — should be resisted. Such measures will not inspire great speeches. But the fact that the answers to America’s racial problems now lie in a more vibrant economy and the nitty gritty of politics and policing is itself a form of progress.